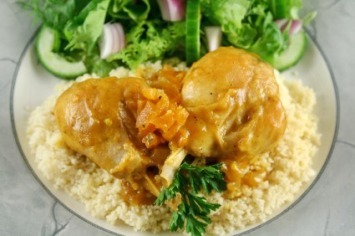 Of all of the easy chicken recipes I have, this apricot chicken has to be my favorite. That is in part because it is so easy, but also because you would not believe from this list of ingredients just how amazing this recipe is. Use a mango puree or spread in place of the apricot for a delicious mango chicken recipe. 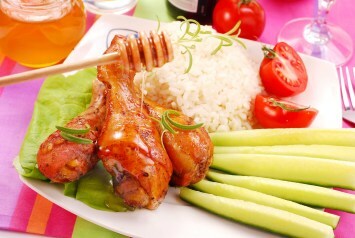 I use sugar free apricot jam or preserves and it works wonderfully, so this is a great diabetic chicken recipe too. Cut the fat by using low fat salad dressing. I have also heard of a similar recipe that uses raspberry preserves or jam, or orange marmalade. I haven’t tried either, but if you like those flavors you may want to give them a try. When I first saw this recipe I was quite hesitant about making it. The mixture just sounded too odd to be very good. I am so glad to have been proven wrong. The variation I had called for Thousand Island dressing, so that is what I use to this day. I have been told the French dressing version is equally good. You won’t believe just four ingredients can be so tasty. How about apricot bars for dessert after your apricot chicken meal? Find the recipe here. This does taste good with a combination of apricot jam and orange marmalade. Catalina salad dressing also works if you don’t have either of the others mentioned. This would make a LOT of sauce though. I use half of this recipe for 3 people and there is still sauce left over. Serve with rice (sauce on the rice is delicious!) & veggies… I’m making this for dinner Friday!